Probably 1960. Kid sister Paula is creeped out by the...the...uh, the...well, let's call it a Goblin. 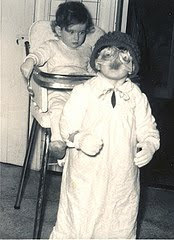 My mother bundled me up in every warm item of clothing I had, topped it with a nightgown and gave me a mask. I don't think there was a plan other than that I shouldn't catch cold. We went trick or treating from our Nana Nolan's house, and all of the neighbours pretended they didn't know who I was. Behind that mask I thought they were being rather silly at first. As houses went by though I was quite taken with the thought that perhaps they really didn't know it was me. I was forgetting that Mommy was waiting for me on the sidewalk. Nowadays I love handing out the candies and pretending to be frightened of the small, confused children and complimenting the more gory big kids. I'll be disappointed if we have too much candy left. Such a fabulous photo. Why wasn't I there? Is there a male human anywhere in your lineage? When it came to Hallowe'en, the male human in our lineage would sneak off early (with a bottle), but be back in time to share the haul. "No fools, no fun, lots of fun at our house!"